The Mighty Swine debut their new video for Last Man Standing on Tuesday April 29 Exclusively via youtube. Shot and Directed by Nikk Hearn-Sutton (RUSH – Time Machine DVD) Last Man Standing is a politically charged modern social commentary on the ever increasing police state tactics used by the American Government against it’s own people ala: the Clive Bundy standoff. A radical change from the party hard content of previous releases, The Mighty Swine are a different animal on this release. The single is already getting modest airplay worldwide and the video should help bring attention to the new Full CD release May 20. 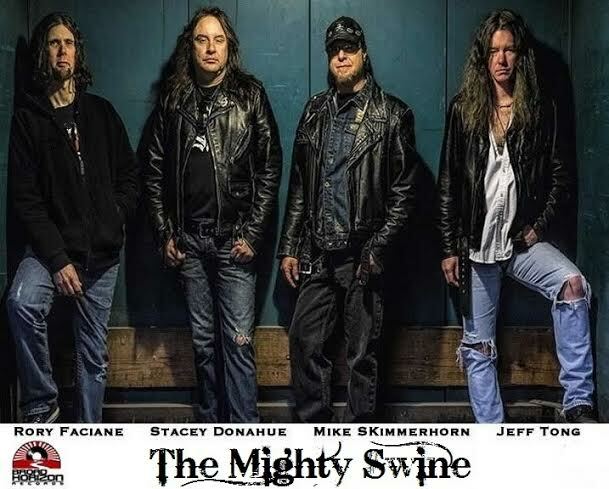 The Mighty Swine are a Guitar Oriented, Lyric Driven, Bass Pounding, Drum Bashing Hard Rock / Melodic Metal Bansd with audible lyrics and hooks. THE MIGHTY SWINE features Cincinnati legend, Mike Skimmerhorn (CHASTAIN/CJSS) on Vocals / Bass, Stacey Donahue and Jeff Tong on Guitar, and Rory Faciane on Drums. Following the success of The Mighty Swine’s 2012 release, Lust, and hot on the heels of Chastain’s Surrender to No One, (Leviathan Records) Bassist Mike Skimmerhorn (CJSS/Chastain/The Mighty Swine) returns with new Guitarist, Stacey Donahue, and new Drummer, Rory Faciane to record their sophomore release for Broad Horizon Records. Enter Stacey Donahue, a relatively unknown outside Northern Ohio with the potential to become ahousehold name. Influenced by Randy Rhoads , Yngwie Malmsteen, & Eddie Van Halen. Stacey brings a progressive style to the otherwise heavy metal thunder of The Mighty Swine and picks up where Lust left off. Infusing emotion with technical ability, Stacey creates a sound that is both classic & progressive at the same time without feeling forced or sterile. Drummer Rory Faciane is a Louisiana native who is making quite a name for himself in Nashville, both on the local and national music scene with his drumming talent. Modern Drummer calls him “a drummer on the move” having recorded albums with rock band Knorr, releasing several drum education videos, and tuning drums for bands like 12 Steps & Mudvayne. A highly sought out session drummer, Rory brings a highly charged assault of the senses on the up coming release. And getting recognized they are. The video for LUST broke 20,000 views on YouTube the first few months out and was listed by Artist Pro as the featured video of the week. It also charted at #1 for 13 weeks straight on Roxwel.com’s Metal AND Rock Charts beating out FFDP, Black Veil Brides, & Megadeth. The band was nominated for a C.E.A. (Cincinnati Entertainment Award) for Best Hard Rock Band (2012) and receive airplay internationally. The Mighty Swine once again return to Fat Track Studios in Cincinnati Ohio to finish up tracks for their upcoming release, Last Man Standing, along with engineer Rob Nadler & Producer Jimi Starr. The 10 song disc will contain 9 original songs, including the title track, along with a scorching rendition of the Judas Priest classic, Hell Bent for Leather, a sort of tongue in cheek nod to Chastain vocalist Leather Leone who Mike recently recorded Surrender to No One with. Hailed by many as one of the most powerful and most influential female vocalists in history of Heavy Metal music Mike has clearly performed with the best, and the upcoming release will leave no doubt in anyone’s minds who will be the Last Man Standing.